Kraft 1/2 lb. Single Layer Tapered Candy Box, 7.5x4x1"
Buy More Ballotin Candy Boxes Save More! These candy gift boxes are perfect for gourmet candy and cookie packaging, wedding favors, or for small gifts. These boxes have a tapered design, with the top being slightly larger than the bottom. The boxes ship and store flat, but are simple to assemble with a double lock bottom and tab locking lid. 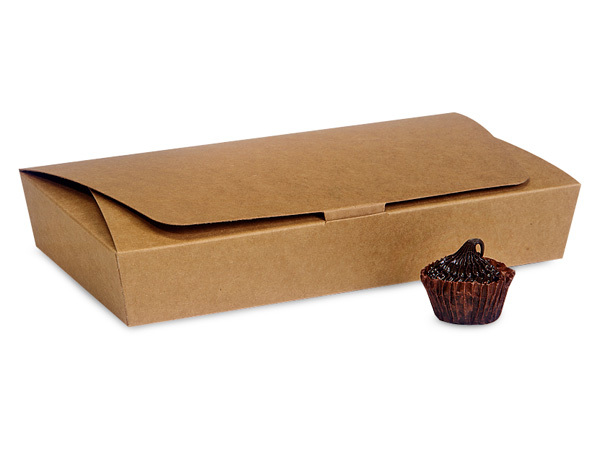 We offer these boxes in both ¼ and ½ lb sizes. You can pair with our candy trays and candy pads to complete your candy package! All of our ballotin candy boxes comply with FDA regulations for food packaging.